Does PhotoBlocker Really Work Against Red Light Cameras? See how this product compared with similar products in a recent test. PhotoBlocker is a clear spray claimed to make the plate so reflective that the camera is blinded by its own flash. Following directions, we applied four coats to each plate, allowing an hour for drying between applications. After running it past our red light camera and photo radar, in photos the highly retro-reflective California plate looked slightly brighter than its untreated sibling. But the numbers remained clearly legible. PhotoBlocker-coated Michigan and Colorado plates were indistinguishable from uncoated versions and our cameras remained unfazed. 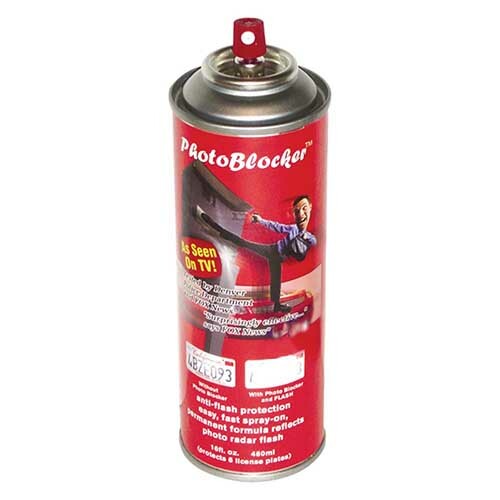 The ingredients on the can of PhotoBlocker looked remarkably similar to those on a can of Ace Hardware clear gloss spray paint ($3.99) we retrieved from the garage. On a hunch, we coated another set of plates with the Ace Hardware stuff and repeated the test—with identical results. The laws of physics likely defeated PhotoBlocker and our Ace Hardware clear spray paint. The substantial distance and sharp angles between the plate, strobe flash and camera would dissipate any increased light long before it could reach the camera lens. And the camera's polarizing filter can brush aside any extra glare. PhotoBlocker overexposed the date stickers, but the camera had no problem reading the plate. Regardless, most red light cameras record digital video of violations. Technicians can fast-forward through an interfering flash of light with a mouse-click. Skeptics may point to videos on the Web where the spray seems to be working. After studying a few of the clips, with some experimentation we discovered the formula for success. Choosing a light-colored, highly reflective license plate like California's is helpful. So is positioning the camera at point-blank range, at plate height and directly behind the car. By bumping up camera flash exposure EV value to +5, eventually we managed to overexpose an image. We just couldn't do it from 80-plus feet away, typical range for a red light camera. 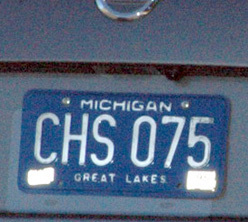 Even on the camera-unfriendly Michigan plate, the numbers could easily be read by the camera. Our conclusion is that while we'd like to believe that clear lacquer spray paint can stymie a photo camera, the reality is a bit different.